Welcome to our website. We are a family run business based in rural Perthshire. 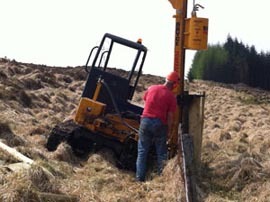 Specialising in Agricultural, Forestry & Domestic fencing all over Scotland. Having over 25 years experience of fence erection & repairs, you can trust in us for all your fencing requirements, large or small. If you're looking for a new garden fence or repairs to your existing fence then call us now. We are a reliable, friendly, experienced company who are very competitive when it comes to cost, without compromising on quality. We cover all of Perthshire, Argyll & the Glasgow area. Call us now to arrange a free, no obligation written quote specific to your fencing needs. Being a farming family we fully understand and appreciate good quality stock fencing. Duncan has been fencing for over 25 years for many farms & estates throughout Perthshire, Tayside & Argyll. All aspects are catered for including supply & erect of fences, gates, strainers, electric fences, watergates etc. We have a bespoke track dumper with a Bryce post chapper that can swivel 180 degrees, making even the most difficult fencing conditions easy! For agricultural & forestry fencing we are able to cover all of Scotland and even the North West of England. We are specialists in foresty fencing, with the Forestry Commission in Scotland being a major client of ours. We have successfully tendered for and completed over 90,000 metres of fencing for the commission in Scotland since October 2010. We have also carried out deer fencing for other private clients in Perthshire & Tayside. We are specialists in organising and managing the distribution of materials to hard to reach work sites with the use of helicopters. We work very closely with PDG Helicopters who we use for all our helicopter lifts. Please see our Gallery page for pictures of a recent lift we undertook for the Forestry Commission.